Large animal collisions can cause serious damage to your vehicle and even bodily injury. 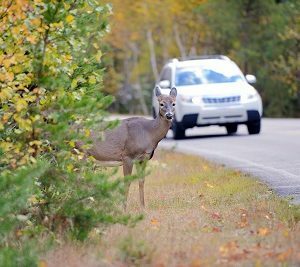 Deer and moose are often drawn to roadways, especially in the Spring and Summer months. Keep a close eye on the sides of the roads at dusk and dawn. These two times are when the danger of an animal collision is greatest. Watch for reflective eyes of the deer and dark silhouettes of the moose. Generally, these animals are found in rural wooded areas but can be anywhere. Slow down if you see a roadside warning. Stay alert and be ready to act. If an impact is unavoidable, steer straight and brake. Release the brake just before impact so the front of your vehicle rises.